The new server is now handling web, time, DNS and email (including an IMAP setup I've never had before). I've got the third drive installed, so I just need to finish copying everything off and then format it and add it into the volume. So first I fought the hardware, spending way too much time in the BIOS before discovering that one of my sticks of RAM is bad (or at least the BIOS won't post with it, but will with the other two). Then I fought the debian installer as I tried to create RAID and lvm. The 114G partition looks weird, but it'll make a lot more sense once I'm able to put the third drive in. I want to do RAID-1 on three 250gig drives to get 375gig usable space, and that requires a pretty fancy game to get up when you first need to copy data off one of the drives before you can use it. Now to actually install software. This blog and blogdowntown are now running off my laptop. I'm copying a bit of leftover content off my desktop, then I'll be yanking the 250gig drive out of it. I'm planning on moving servers this evening, so if something seems funky you can likely blame that. This is a bit of an intricate move even though nothing's leaving my apartment, but in the end it'll greatly simplify the way I host this stuff. In the end, though, it's not as ugly as the configuration I once used to serve this site (October 2004). Basically right now I've got an ancient PIII 500 up in the ceiling as a server. It's slow on the dynamic stuff, so all blog URLs are proxied through to my faster desktop (err... is it a desktop is it's actually supporting the desk?). The server in the ceiling also does NAT for the apartment network and acts as internal media server. Rush Job == No Editors || Broken Publishing System? But then, deputies at the scene learned the car was a rare Enzo Ferrari, one of only 400 in the world. The only person on the side the road was a former European video game mogul who said he was a passenger in the car and that the driver, a man who only knew as "Dietrich" had fled into the hills. So began a mystery that detective in California and Scotland Yard have been trying unravel for three months, a twisted case that involves Swedish mafia, fake "homeland security" officers and an $3.5 million exotic car collection. Authorities said was legally drunk at the time. He was also charged with a firearms violation because of gun detectives found during his search of his Bel-Air estate. Eriksson, according to court papers, is convicted felon for counterfeit and drug crimes in Sweden and as result is barred from possessing guns. In all, the problems make up such a high percentage of the piece that I've made them into a PDF so that you can see for yourself. 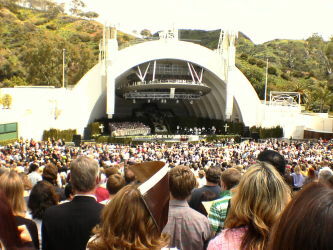 My church, Bel Air Presbyterian, held its Easter morning service at the Hollywood Bowl yesterday. Normally you'd think "outdoor... LA... no problem", but this Spring things have been a bit more dicey. Nevertheless the weather cooperated yesterday and the service was great. I was a little worried how the parking situation was going to come out. Normally I'd never drive to the Bowl -- subway to Hollywood/Vine and a shuttle up the hill works much better -- but the full compliment of Bowl transit wasn't running yesterday. We sat for ten or fifteen minutes waiting to get to the parking, but somehow managed to make it out afterward quicker than we often would have at the church itself. Someone just used an IM bot to message me. It looks to have been seeded with one bit of seemingly sentient information (the initial message mentioned that I was getting married), and then the bot took over from there. The person who sends the bot gets to sit back, watch the traffic, and hopefully laugh as they trick someone into thinking they're speaking to a real person. I don't know who sent it, so I'm not sure whether or not that person realized I wrote a bot to do the exact same thing. And I did it back in December of 1999. HoserAIMa spoke via Net::AIM and backended to Eliza. I had a console where I could inject messages into the conversations I was watching to pull people back right when they were starting to get frustrated enough to give up on the bot (or had started to see through its ruse). Now that we're running our email on a server where we pay for bandwidth, I've realized I need to become a lot more conscious of how people use email. There's no excuse for busting up our 95th percentile just because someone's downloading or sending attachments. This morning I saw a couple periods of pretty constant traffic into and out of the server, and judging by how the server bandwidth graphs correspond to the interface stats on the router, it seems that it's pretty much all traffic from the office. It's not a lot of users; just "fat" traffic from a few of them (attachments, perhaps). We're moving email service here at the office, from ISP hosted mail to our colocated server. Friday I set up the new accounts and around 5:30 or so I switched MX to point to the new address. That meant that I knew all weekend there were going to be issues when I walked in the door today. It's a fact of life: you move services between disparate hosts and something's not going to work right. I'm using qpsmtpd as my SMTP server, and all my test messages had been small. Because of that, I didn't know my spool dir was set up incorrectly and was unwritable by the mail daemon. courier-imap defaults to setting MAXPERIP to 4 connections per IP address. When everyone fired up email this morning errors started popping up and nothing showed in the logs. Once I figured out what was up (though really I didn't... pcg quessed it) it was an easy change. So after a bit of a hairy morning I think everything's running smooth now. As I mentioned that I would a few days ago, I moved our office network from a little Netgear DSL router to letting the Xserve do NAT and firewall.